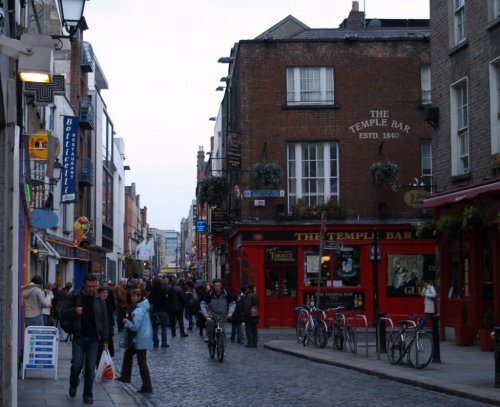 The Temple Bar area is south of the River Liffey in central Dublin. 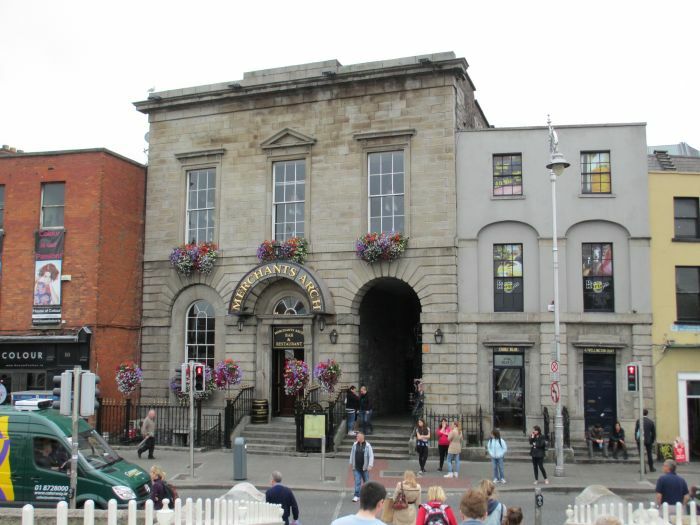 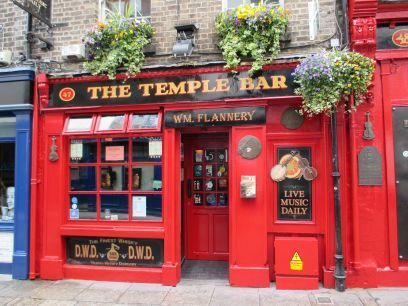 The name derives from the Temple family, who lived in the area in the 17th century; Sir William Temple was provost of Trinity College Dublin in 1609 and had his house and gardens here, though the earliest historical reference to the name Temple Bar is on a 1673 map. 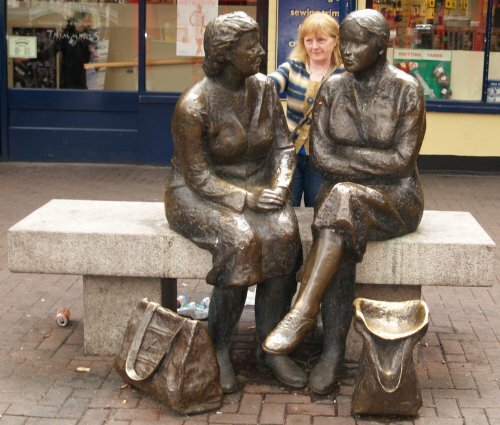 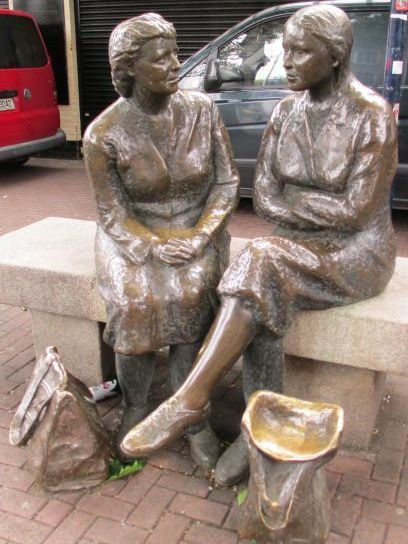 Dublin: On the north side of the River Liffey is the sculpture of two women in Lower Liffey Street (affectionately known as 'the hags with the bags'), somewhat damp (and blurred) in the pouring rain but the chat (or should I say 'craic') goes on! 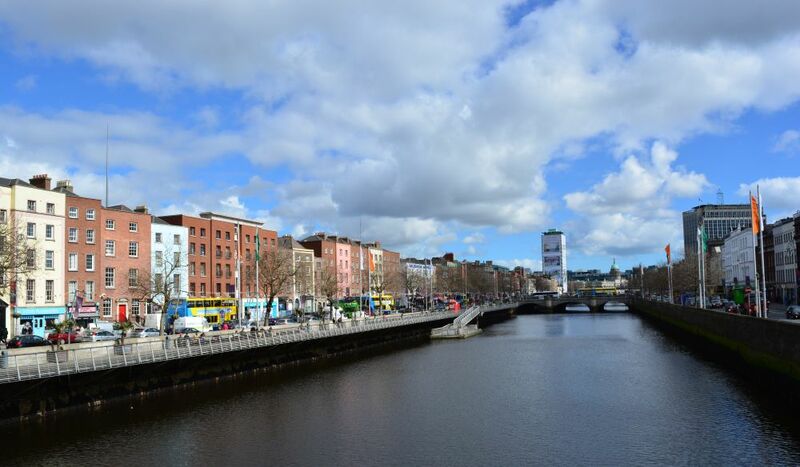 Looking east down the River Liffey to O'Connell Street Bridge. 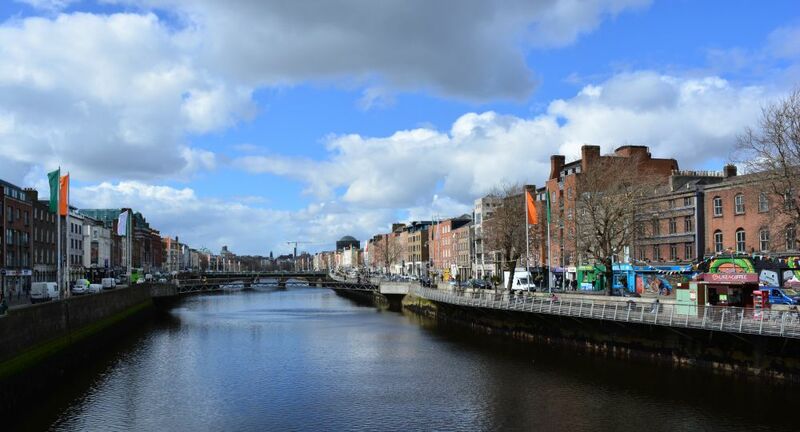 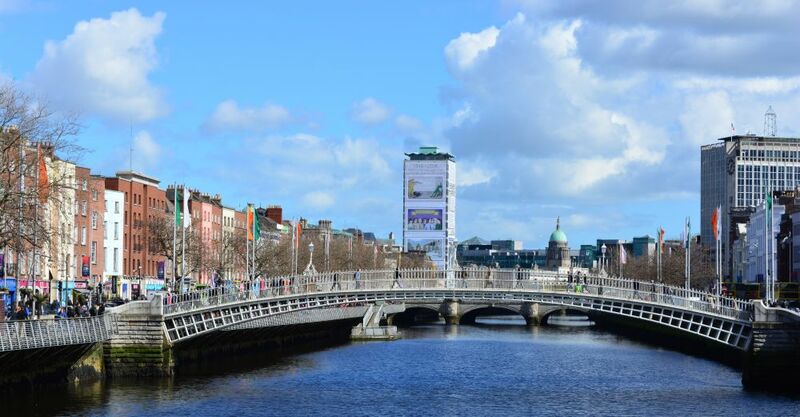 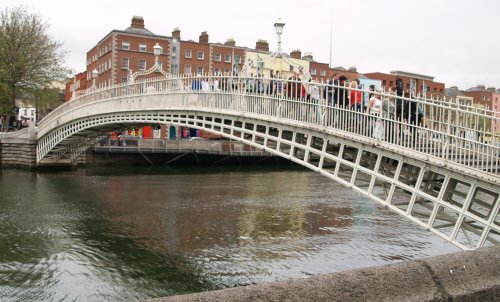 View of the Ha'penny Bridge, looking east down the River Liffey. 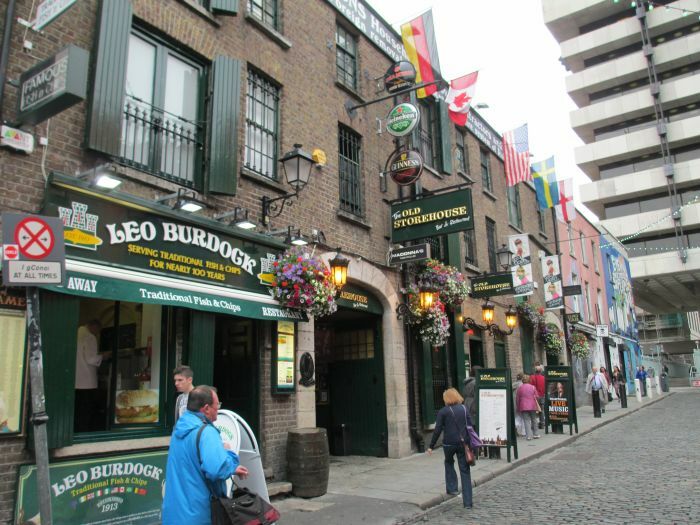 Dublin: Moving on when the rain had eased we crossed the Ha'penny Bridge (built 1816) and through the arched alley entrance to Temple Bar called the Merchants' Arch (on the right below). 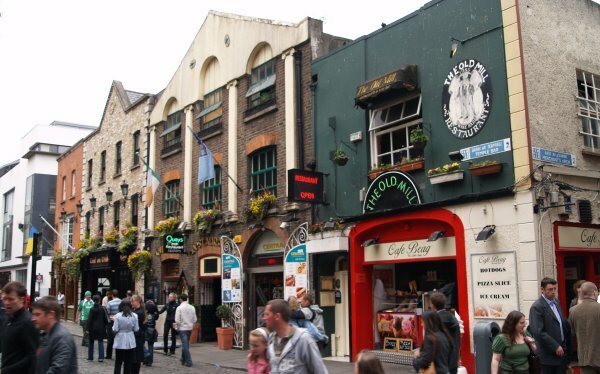 Temple Bar is popular 'night out' but in 1999, stag parties and hen nights out were supposedly banned or discouraged from Temple Bar, mainly due to drunken loutish behaviour, this may have lapsed somewhat, but the noise and anti-social behaviour from drinking alcohol still remains a problem at night, but this should deter you from a good night out enjoying the craic, music and general ambience of the pubs, bars, restaurants, nightclubs and hotels. 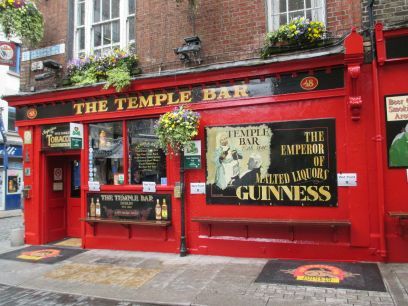 The famous 'Temple Bar' bar! 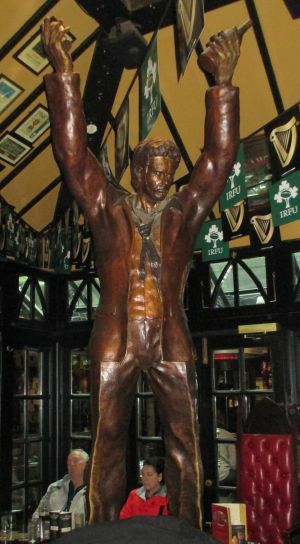 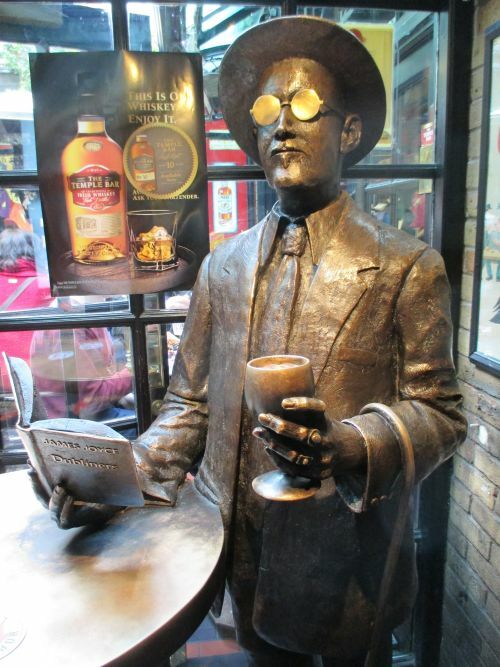 Right: Inside the Temple Bar pub is a sculpture of ? 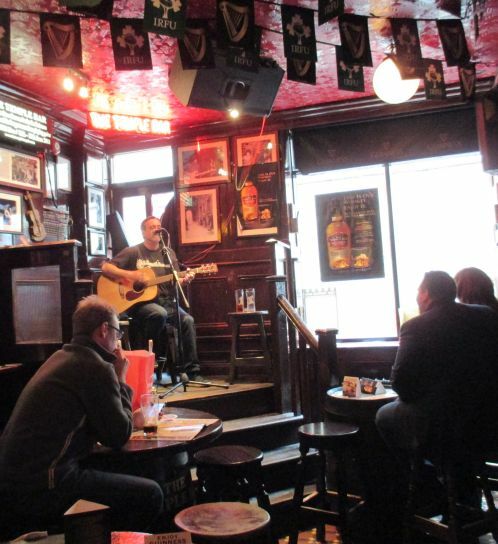 The Oliver St John Gogarty Bar, restaurant and accommodation, and another popular venue for traditional Irish music. 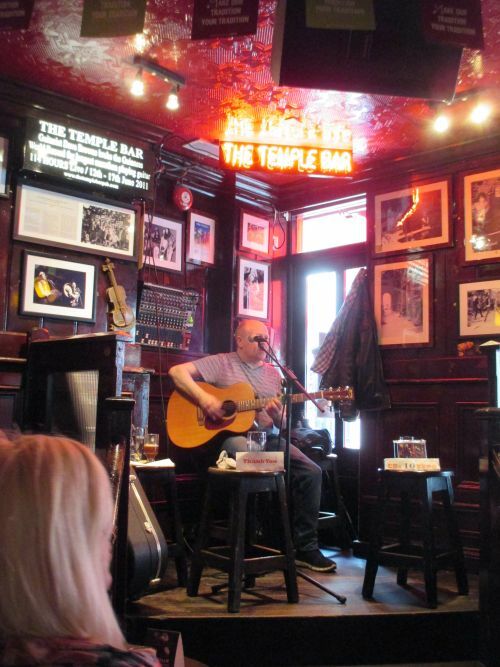 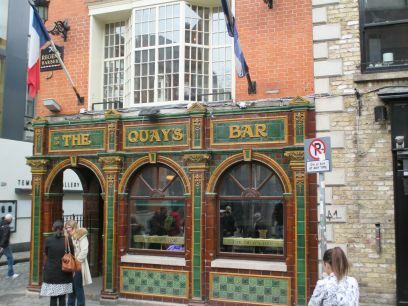 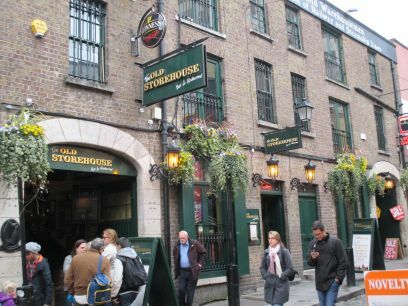 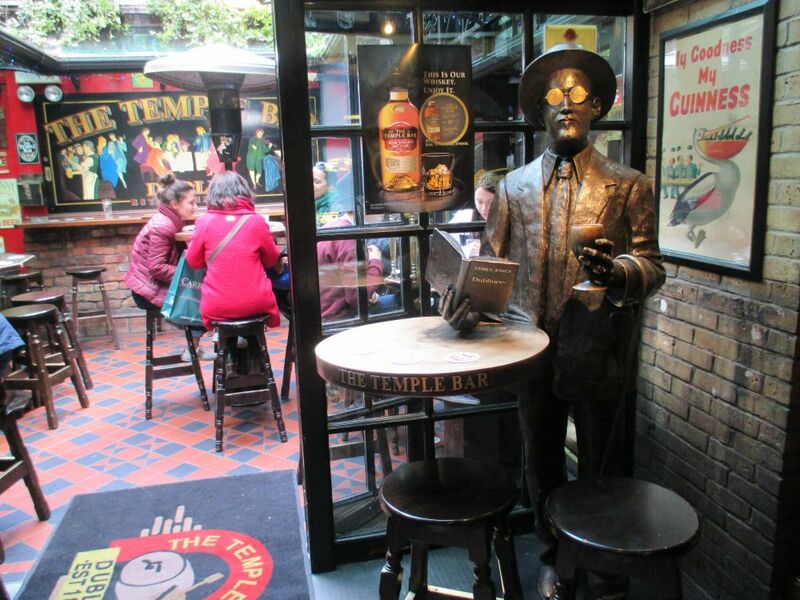 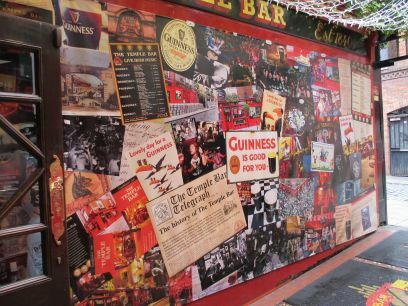 Dublin: There are many interesting shops and even more bars in the Temple Bar area. 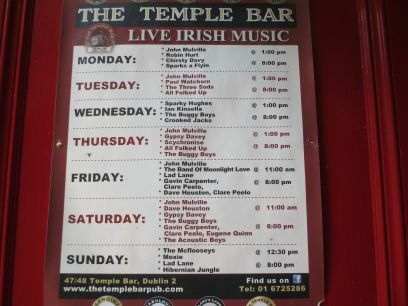 Many pubs lay on traditional Irish music in the evening. 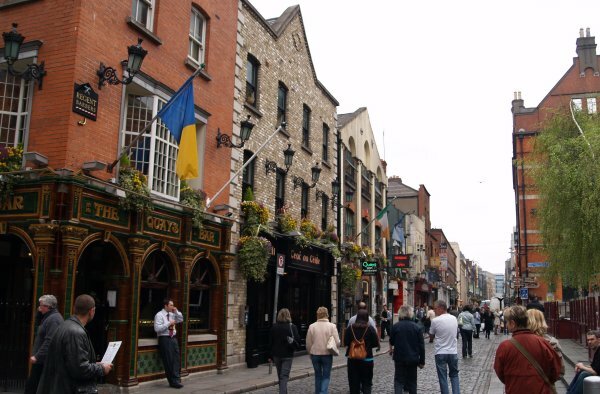 Fishamble Street in Temple Bar was the location of the first performance of Handel's Messiah on 13th April 1742 though Irish history neglects to mention the first performance of the Messiah in Chester Cathedral, England, by Handel en route to Dublin! 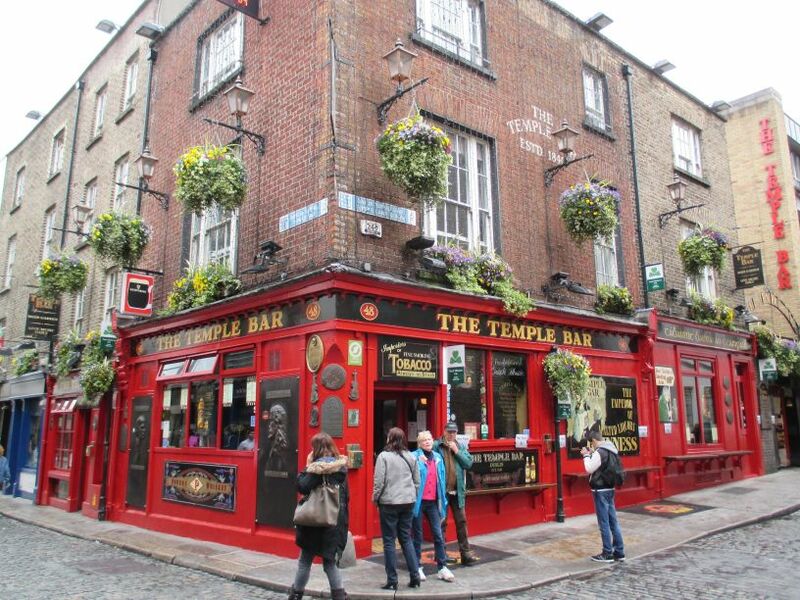 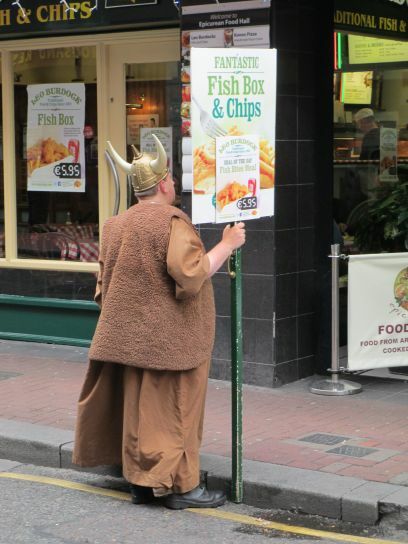 Dublin: Lots of places to poke your nose in the Temple Bar area south of the River Liffey. 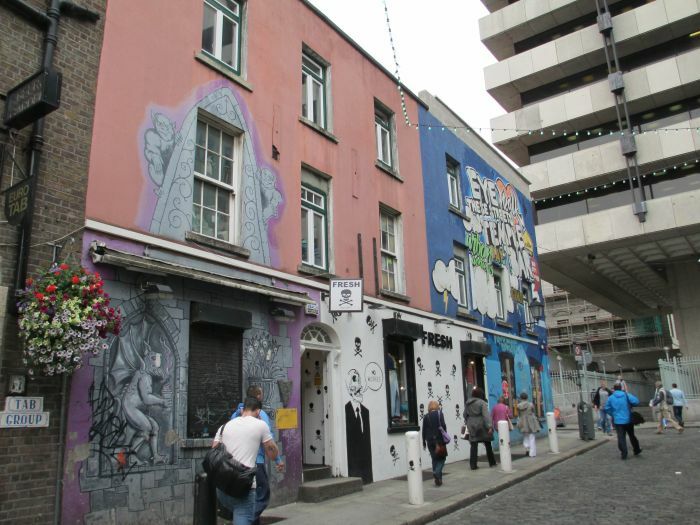 From the 19th century to the 20th century the area declined in what seemed 'terminal decay' but the Taoiseach Charles Haughey was responsible for securing funding and, in 1991, the government set up a not-for-profit company called Temple Bar Properties to oversee the regeneration of the area as Dublin's cultural quarter. 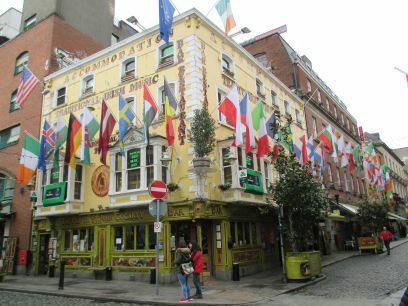 The Temple Bar area hosts some important Irish cultural institutions, including the Irish Photography Centre (incorporating the Dublin Institute of Photography, the National Photographic Archives and the Gallery of Photography), the Ark Children's Cultural Centre, the Irish Film Institute (incorporating the Irish Film Archive), the Temple Bar Music Centre, the Arthouse Multimedia Centre, Temple Bar Gallery and Studio, the Project Arts Centre, the Gaiety School of Acting, IBAT College Dublin, as well as the Irish Stock Exchange and the Central Bank of Ireland.